View Chapel Hill Homes for Sale on the Interactive Chapel Hill Real Estate Map. Triangle Real Estate Journal advertises all Chapel Hill real estate listings and Chapel Hill homes for sale from the local Triangle MLS. Chapel Hill has a diverse blend of single family detached homes, condos, and town homes.Home prices in Chapel Hill range from the high $100,000's to the several millions. Whether you are looking to buy a home near UNC or downtown Chapel Hill or in the suburbs you are sure to be delighted. Chapel Hill is very desirable and the community is often featured in national magazines such as Forbes and Fortune. To search Chapel Hill homes by the specific Chapel Hill School High School Area. Our Chapel Hill home search tool allows you to select all your important criteria so you can view the Chapel Hill homes for sale most relevant to you, the home buyer. If your focus is 4 bedroom homes for sale in Chapel Hill with a master on the 1st floor, we can do that. If you are searching for a 5 bedroom home for sale in the Chapel Hill School District. We can do that too! Have a look at all the criteria and enjoy the home searching process. Chapel Hill NC is the home of the University of Chapel Hill (UNC). Chapel Hill features many beautiful neighborhoods, a fantastic school system (one of the best in the state), and many Tar Heel basketball fans. Franklin Street is the main thoroughfare of Chapel Hill and it borders the north side of UNC Chapel Hill. Many restaurants, bars, cafes, coffee shops, retail stores, and offices line Franklin St.
Chapel Hill is located about 30 minutes from the RDU Airport and to various Research Triangle Park job locations. 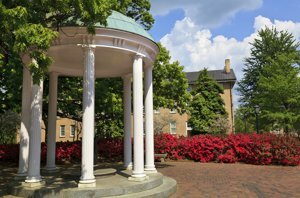 The prime location and atmosphere makes Chapel Hill one of the nation's premier addresses. 10 Most Expensive Homes For Sale in Chapel Hill - See the creme de la creme of Chapel Hill's luxury real estate market. Click below to view newest Chapel Hill real estate listings or create your own custom search of homes for sale in Chapel Hill.